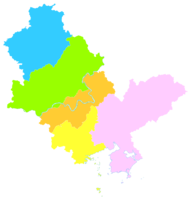 The Pearl River Delta Metropolitan Region (PRD, Chinese: 珠江三角洲城市圈; pinyin: Zhūjiāng Sānjiǎozhōu Chéngshìquān) is the low-lying area surrounding the Pearl River estuary, where the Pearl River flows into the South China Sea. It is one of the most densely urbanized regions in the world, and is often considered as a megacity. It is now the wealthiest region in South China and one of the wealthiest in the whole China along with Yangtze River Delta in East China and Jingjinji in North China. The region's economy is referred to as Pearl River Delta Economic Zone, it is also part of the Guangdong-Hong Kong-Macau Greater Bay Area. The PRD is a megalopolis, with future development into a single mega metropolitan area, yet itself is at the southern end of a larger megalopolis running along the southern coast of China, which include metropolises such as Chaoshan, Zhangzhou-Xiamen, Quanzhou-Putian and Fuzhou. The nine largest cities of the PRD had a combined population of 57.15 million at the end of 2013, comprising 53.69% of the provincial population. According to the World Bank Group, the PRD has become the largest urban area in the world in both size and population. The west side of this region, along with Chaoshan, was also the source of much Chinese emigration from the 19th to the mid 20th centuries, including to the Western world, where they formed many Chinatowns. Today, much of the Chinese diaspora in the US, Canada, Australia, Latin America, and much of Southeast Asia traces their ancestry to the west side of this region. Its dominant language is Cantonese. 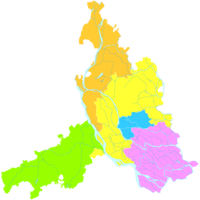 The river delta, also known as the Golden Delta of Guangdong, is formed by three major rivers, the Xi Jiang (West River), Bei Jiang (North River), and Dong Jiang (East River). The flat lands of the delta are criss-crossed by a network of tributaries and distributaries of the Pearl River. The Pearl River Delta is actually two alluvial deltas, separated by the core branch of the Pearl River. The Bei Jiang and Xi Jiang converge to flow into the South China Sea and Pearl River in the west, while the Dong Jiang only flows into the Pearl River proper in the east. The Xi Jiang begins exhibiting delta-like characteristics as far west as Zhaoqing, although this city is not usually considered a part of the PRD region. After passing through the Lingyang Gorge and converging with the Bei Jiang, the Xi Jiang opens up and flows as far east as Nansha Qu and as far west as Xinhui. Major distributaries of the Xi include Donghui Shuidao, Jiya Shuidao, Hutiaomen Shuidao, Yinzhou Hu, and the main branch of the Xi Jiang. 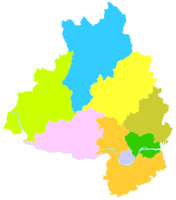 Jiangmen and Zhongshan are the major cities found in the western section of the delta. The Bei Jiang enters the delta plains at Qingyuan but doesn't begin to split until near Sanshui. 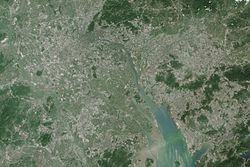 From here the two main distributaries are Tanzhou Shuidao and Shunde Shuidao which form multiple mouths along the west side of the Pearl River's estuary. Two other distributaries, Lubao Yong and Xinan Yong, split from the Bei further north and converge with the Liuxi He to form the main branch of the Pearl River just north of Guangzhou. 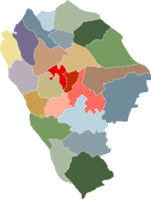 The other major city in the north section of the delta is Foshan. The Dong Jiang flows through Huizhou into the delta. It begins diverging northeast of Dongguan into many distributaries, including the Dongguan Shuidao. Distributuares enter the Pearl River as far north as Luogang and as far south as Hu Men (Tiger Gate). Saltwater crocodiles were present within the Pearl River estuary during antiquity. 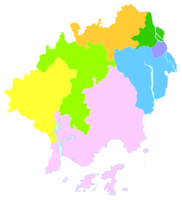 As well as the delta itself, the term Pearl River Delta refers to the dense network of cities that covers nine prefectures of the province of Guangdong, namely Guangzhou, Shenzhen, Zhuhai, Foshan, Dongguan, Zhongshan, Jiangmen, Huizhou and Zhaoqing, and the SARs of Hong Kong and Macau. The 2010/2011 State of the World Cities report, published by the United Nations Human Settlements Programme, estimates the population of the delta region at 120 million people; it is rapidly urbanising. The eastern side of the PRD (Shenzhen, Dongguan), dominated by foreign capital, is the most developed economically. The western areas (Foshan, Zhuhai, Zhongshan, Jiangmen), dominated by local private capital, are open for development. New transport links between Hong Kong, Macau and Zhuhai in the PRD are expected to open up new areas for development, further integrate the cities, and facilitate trade within the region. The Hong Kong–Zhuhai–Macau Bridge, and the proposed Shenzhen–Zhongshan Bridge, currently in the planning phase, will be amongst the longest bridges in the world with a total length of approximately 50 km (31 mi) each. Until c. 1985, the PRD had been mainly dominated by farms and small rural villages, but after the economy was reformed and opened, a flood of investment turned it into the land's economic powerhouse. The PRD's startling growth was fueled by foreign investment coming largely from Hong Kong manufacturers that moved their operations into the PRD. In 2003, Hong Kong companies employed 11 million workers in their PRD operations. Lately there have been extreme labour shortages in the region due to runaway economic growth which caused wages to rise by about 20 to 30 percent in the past two years. The Pearl River Delta has been one of the most economically dynamic regions of the People's Republic of China since the launch of China’s reform programme in 1979. With annual gross domestic product growth of 13.45 percent over three decades since 1978, it is 3.5 percentage points higher than the national average. Since 1978, almost 30% of all foreign investment in China was in the PRD. In 2007 its GDP rose to US$448 billion which makes its economy about the size of Taiwan's and by 2017 this figure has increased to US$1.5 trillion ( or US$3.0 trillion in PPP), about the same size as Russia. The abundance of employment opportunities created a pool of wealthy, middle-income, professional consumers with an annual per capita income that puts them among China's wealthiest. Since the onset of China’s reform program, the Pearl River Delta Economic Zone has been the fastest growing portion of the fastest growing province in the fastest growing large economy in the world. 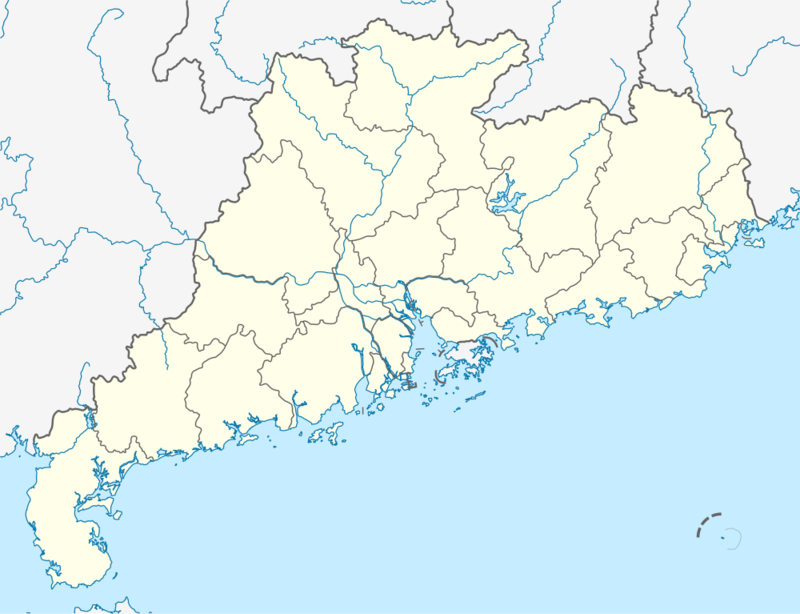 Dongguan, Zhongshan, Nanhai, and Shunde (the later two are now districts of Foshan) the four cities known as the Four Guangdong Dragons for its high growth rates and rapid development from late the 1980s to the 2000s. According to the 2000 national Census, the Zone had a population of 40.8 million people. Per capita income has been growing substantially in recent years, as have consumer expenditures. Although the Pearl River Delta Economic Zone encompasses only 0.4 percent of the land area and only 3.2 percent of the 2000 Census population of mainland China, it accounted for 8.7 percent of GDP, 35.8 percent of total trade, and 29.2 percent of utilised foreign capital in 2001. These figures show the remarkable level of economic development to which the Pearl River Delta has been subjected in order to become an 'Economic Zone', as well as the international orientation of the region’s economy. This orientation has attracted numerous investors from all over the world who use the Greater Pearl River Delta region as a platform for serving global and Chinese markets. As of 2008, the Central Government has introduced new labor laws, environmental and other regulations to reduce pollution, industrial disputes, produce safer working conditions and protect the environment. The costs of producing low margin and commodity goods have increased. This is on top of the rising cost for energy, food, transport and the appreciation of the Renminbi against the falling US Dollar. Some manufacturers will need to cut costs by moving up the value chain or moving to more undeveloped regions. The industrial cities in the Pearl River Delta has been called the "Factory of the World" or the "World's Factory" due the presence of industrial parks populated with factories from foreign investments. The target market of the delta region's exports, however, has become increasingly domestic rather than foreign. The Pearl River Delta has become the world's workshop and is a major manufacturing base for products such as electronic products (such as watches and clocks), toys, garments and textiles, plastic products, and a range of other goods. Much of this output is invested by foreign entities and is geared for the export market. The Pearl River Delta Economic Zone accounts for approximately one third of China's trade value. Private-owned enterprises have developed quickly in the Pearl River Delta Economic Zone and are playing an ever-growing role in the region's economy, particularly after year 2000 when the development environment for private-owned enterprises has been greatly relaxed. Nearly five percent of the world's goods were produced in the Greater Pearl River Delta in 2001, with a total export value of US$289 billion. Over 70,000 Hong Kong companies have factory plants there. PRD is served by five different metro systems throughout the metropolitan area consisting of Guangzhou Metro, Shenzhen Metro, MTR, FMetro, and Dongguan Rail Transit. Both Guangzhou and Hong Kong are also served by tram systems: Guangzhou Trams, Hong Kong Tramways, MTR Light Rail, and Peak Tram. Currently, four additional metro and tram systems are under construction: Macau Light Rail Transit, Shenzhen Trams, Zhuhai Trams, and Foshan Trams. Also, three additional systems are under planning stage: Zhongshan Metro, Huizhou Metro, and Zhuhai Metro. All cities are served by buses and taxis, while some cities may still offer motorcycle service. PRD is covered by seven civilian airports, with five in Mainland China and two in special administrative regions. Two of the Mainland Airports have international flights. The entire PRD is fully covered by railway, high-speed rail, or intercity-rail services. There are daily high-speed catamaran services throughout the PRD region. Density: 1,708.47/km2 Also known to many English speakers as Canton, Guangzhou is the capital of Guangdong province. It is a port on the Pearl River, navigable to the South China Sea, and is cultural and political center of the Pearl River Delta. Density: 5,202.37/km2 Shenzhen is a Special Economic Zones (SEZ) in China. It has been one of the fastest growing cities in the world due to its proximity to Hong Kong. It also has one of the busiest ports in the world. Density: 905.00/km2 Zhuhai plays a similar role to Shenzhen and became the first of the Special Economic Zones (SEZ) in China. Since the late 1970s it has been one of the fastest growing cities in the Pearl River Delta due to its proximity to Macau. Density: 1,869.62/km2 Foshan is an old town dated back many centuries. It was famous for its porcelain industry. It is now the third largest city in Guangdong'. The city is relatively affluent when compared to other Chinese cities, and it is home to many large private enterprises. Foshan recently has seen a transformation brought by China's booming economy. City administration is considered especially progressive in seeking foreign direct investment especially in Nanhai District which has closes ties with Guangzhou to form a Guangzhou-Foshan metro in the near future. Density: 3,334.78/km2 Dongguan borders the provincial capital of Guangzhou to the north, Huizhou to the northeast, Shenzhen to the south, and the Pearl River to the west. It is also home to the world's largest shopping mall, South China Mall. Density: 1,750.35/km2 Zhongshan is a mid-size city named after Sun Yat-sen (who had the alternate name Sun Zhongshan), who is widely considered to be the "Father of modern China" and was born in Zhongshan's Cuiheng village in 1866. Zhongshan serves as a midway point between Guangzhou and Macau. Zhongshan is known in China for making lamps. Density: 471.12/km2 Jiangmen Port is the second largest river port in Guangdong province. The local government plans to develop a harbour industrial zone with heavy industries such as petrochemical and machinery industries. The port of Jiangmen was known as Kong-Moon when it was forced to open to western trade in 1902. One legacy of this period is a historic waterfront district lined with buildings in the treaty port style. The city has an ongoing renewal project which has restored many of these buildings. Density: 420.89/km2 Huizhou is the most eastern city in the Pearl River Delta region. Huizhou is known for its West Lake scenery. Huizhou gained benefit from the Chinese economic reform of the late 1980s. The blossoming real estate market attracted capital investment from Hong Kong and Taiwan. In the provincial economic development strategy, Huizhou is regarded as a site for a world-class petrochemical industry, as well as a hub for developing information technology, and expanding exports and trade. Density: 263.11/km2 Zhaoqing is the most western city in the Pearl River Delta region. It is well known for being a regional tourist hub, a medium-sized provincial "college town" as well as an up-and-coming manufacturing center. Residents from Guangzhou, Shenzhen and other nearby cities, as well as people from Hong Kong and Macau, are known to visit the city on weekend getaways and excursions. Density: 6,396.01/km2 Hong Kong Island was first occupied by British forces in 1841, and then formally ceded from China under the Treaty of Nanjing at the end of the war. Hong Kong remained a crown colony of the United Kingdom until 1997 when it was returned to China. Hong Kong is known as one of the world's leading financial capitals also a major business and cultural hub. 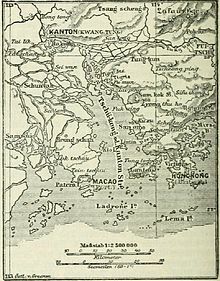 Density: 18,153.33/km2 Macau was first Portuguese settlement in China on 1557. 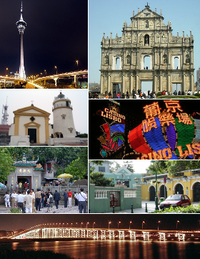 Macau remained a colony of Portugal until 1999 when it was returned to China. Macau has developed into a notable tourist industry that boasts a wide range of hotels, resorts, stadiums, restaurants and casinos. This makes it one of the richest cities in the world. A 2011 article in British newspaper The Telegraph reported on a "Turn The Pearl River Delta Into One" project. The stated goal was to "mesh the transport, energy, water and telecommunications networks of the nine cities together." (Hong Kong and Macau were not included.) However, the Chinese government denied that such a project existed. The Pearl River Delta is notoriously polluted, with sewage and industrial waste treatment facilities failing to keep pace with the growth in population and industry in the area. A large portion of the pollution is brought about by factories run by Hong Kong manufacturers in the area. Much of the area is frequently covered with a brown smog. This has a strong effect on the pollution levels in the delta. Pollution is a great risk to the Chinese white dolphins that inhabit the area. On March 22, 2007 the World Bank approved a $96 million loan to the PRC government to reduce water pollution in the Pearl River Delta. On December 23, 2008 it was announced that ¥48.6 billion (about $7.1 billion) will be spent on the river by mid-2010 to clean up the river's sewage problems quoted by Zhang Hu, the director of Guangzhou municipal bureau of water affairs. The city will build about 30 water treatment plants, which will treat 2.25 million tonnes of water per day. The program hopes to cut down the amount of sewage in the area by 85%, and was also of fundamental importance for the 2010 Asian Games held in Guangzhou from November 12, 2010 to November 27, 2010. 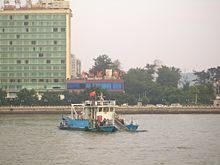 In October 2009, Greenpeace East Asia released a report, "Poisoning the Pearl River" that detailed the results of a study it conducted in which 25 samples were collected from five manufacturing facilities in the Greater Pearl River Delta. The study concluded that all the facilities sampled were discharging waste-water containing chemicals with proven or suspected hazardous properties including beryllium, copper, manganese, and heavy metals, as well as high levels of organic chemicals. These substances are associated with a long list of health problems such as cancer, endocrine disruption, renal failure and damage to the nervous system as well being known to harm the environment. Three of the five facilities sampled (Qingyuan Top Dragon Co. Ltd, Wing Fung P.C. Board Co. Ltd. and Techwise Qingyuan Circuit Co. Ltd. ) contained concentrations of chemicals which exceeded the limits set by Guangdong provincial effluent standards. These companies were then subjected to a Clean Production Audit according to Article 28 of China's Cleaner Production Promotion Law. Guangdong Environmental Protection Bureau took a stance against the companies by blacklisting them. ^ 广东男性比女性多了500万 人口总量增长放缓_新浪广东城事_新浪广东 (in Chinese). ^ Atlas of China, page 123. SinoMaps Press, 2007. ^ Vidal, John (March 22, 2010). "UN report: World's biggest cities merging into 'mega-regions'". guardian.co.uk. Retrieved 2010-05-13. ^ "Labor shortage to affect Pearl River Delta hardest". ^ "A Stronger Pearl River Delta" (PDF). ^ "Achievements, challenges in China's Pearl River Delta plan". ^ "Economic Backdrop of the PRD" (PDF). ^ "Introducing the Pearl River Delta". ^ "How Hong Kong's poorer workers can gain from Greater Bay Area". South China Morning Post. Retrieved 2018-03-30. ^ "Greenpeace welcomes Guangdong's move to blacklist 20 polluting companies". ^ "Poisoning the Pearl River: 2nd Edition".